I’m grand, so I am. On paper I’m grand. I’d even go so far as to say I’m perfect. Been there, done that worn the t-shirt. Four times. Got a question about kids? Breast feeding perhaps? Having a wee spot of trouble with potty training? A picky eater? What about teething? Need a quick solution for getting them to stay in their beds and sleep through the night? Okay, scrap that last one. You’re on your own there. No-one and I mean no-one, no matter what qualifications they claim to have, they may have half the alphabet after their name, forget it. This one is still the Holy Grail and we’ll all searching for it. But I could give a half decent attempt at all the rest, maybe even solve your problem. Kids will do that, see. They educate you in ways you never thought possible. There isn’t a book in any shop in any part of the world that will teach you how to be a parent so keep your hard earned cash for something nice and return the book to the shelf. Learning comes from doing. I am a firm believer in that. Even before I had my own crew I knew being the oldest of 8 children was akin to reading a book on how to drive a car and expecting to know how to afterwards. I knew all the semantics, the rules of the road, even what would happen in the event of a screw up. But I had no idea what that crash would actually be like in reality when it happened. To be honest I’m still just winging it. But sssshhhh. Don’t tell anyone. Then I was contacted with a request for some tips for a magazine feature on how to keep kids focused during every day activities and on their homework because I have the aforementioned four kids and know everything. I drew an absolute blank. 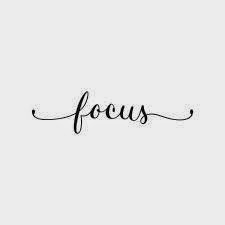 Focus? What do they mean by focus? What are they asking me for? The only focus I know is a car model. My kid’s idea of focus is the 3D option on Netflix. I was seriously stuck and beginning to question my parenting skills big time. I couldn’t pull that rabbit out of the hat. I did give it some serious thought before making an appointment with Dr. Google. I got my money’s worth. There were some gems in there and I read them all, nodding along and taking a few notes before realising something. We do do this. We do focus. What do you know? We’re not a total disaster. We’ve been focusing all along and I wasn’t even aware of it. This is the prescription Dr. Google gave me. Exercise. Moving is great for the mind and my boys are very active. In fact they never stop. The three school goers have told me they love the ten minutes run around with their friends in the morning before the school gates open. Down time. This helps clear the mind before tackling a job and makes it easier to focus. When the boys come in from school they veg on the couch for twenty minutes. It’s always much easier to get them to hit the homework once they get to relax first. Sleep. We all need to recover and when we benefit from a good night’s rest, we can give it our all the next day. Mine can’t handle late nights. One is okay but if there are two in a row the next day can be, shall we say, challenging. Reducing screen time. My boys would sit in front of the television and play their consoles all day becoming crotchety and tired as a result. We all need a break from fast flashing images. Kids are no exception. Routine. Possibly my favourite word! I like to know what’s around the corner as much as is possible so I can be prepared for it. Kids are the same. It gives them a sense of security. Unbeknownst to myself we were doing all of those things. And a few more besides. I can take a deep breath now and focus on my glass of white wine. I’m grand so I am! And I bet you are too!